Lagrima, Adelita, Recuerdos de la Alhambra, Maria, Tarrega. 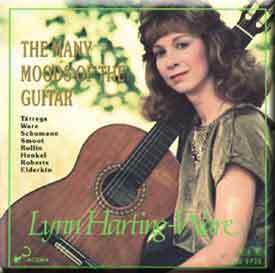 The Many Moods of the Guitar is Lynn Harting-Ware’s premiere recording and showcases a great diversity of material in its 28 tracks. Robert Finn of the Cleveland Plain Dealer writes: “The playing is clean, idiomatic, and fluent and shows both sympathy and expertise with a wide variety of styles.” Beginning and ending her program in the Spanish vein with the music of Tarrega, she departs with tradition in Peter Ware’s Nakina suite which is “imbued with elements of jazz and blues” (Classical Music Magazine). Next heard are her arrangements of Schumann’s Kinderszenen, featuring the famous Traumerei. Richard Smoot’s Music for the Waiting Angel bespeaks the new age aesthetic, while William Robert’s Satiesque miniatures comprising The Blue Guitar draw influence from popular styles. Kathy Henkel’s River Sky and Stephen Elderkin’s Manifestations of the Spirit resound the New Romanticism. "She plays so well that the colorful, poetical new pieces blend imperceptibly with standards such as Trrega's Recuerdos de la Alhambra and Adelita." "The most successful items are Ware's "Nakina" which manages to be arresting and original while taking a quite traditional approach to the instrument and two neo-baroque pieces by Harting-Ware herself" Dance and Fantasy-Ricercare"
©2016 Ware Academy of Music Market Village, 4350 Steeles Avenue East, Kennedy & Steeles.